Vassilis Varvaresos 2017-2018 season includes performances at the Sommets Musicaux de Gstaad, the Enescu Festival, the Festival des Arcs, the Festival des Musicales du Golfe, the SenLiszt Festival of the Gyorgy Cziffra Foundation and the Athens Festival . His concerto appearances this season include Chopin's Piano Concerto no. 2 with the Orchestre de Normandie, Tchaikovsky's Piano Concerto no. 1 with the Freiburg Symphony Orchestra, and Beethoven's Piano Concerto no. 4 with the Thessaloniki State Symphony Orchestra. Mr. Varvaresos will be making his debut at the Istanbul Music Festival this summer, performing Prokofiev's Piano Concerto no. 4, for the Left Hand. 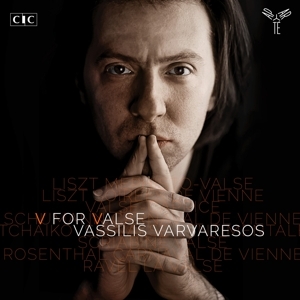 The previous season marked Mr. Varvaresos debut recitals in the Tonhalle of Zurich and the Musikverein of Vienna. He was equally invited at the Salle Gaveau of Paris, and Amsterdam's Concertgebouw, while he gave recitals and masterclasses in California, Cincinatti and Charleston USA. 2016 summer he has appeared at the Chopin Festival of Nohant, the Festival du Classique au Vert in Paris and the Festival des Arcs in the Bourg-Saint-Maurice. He is a regular guest of the Nohant Festival, the Lisztomanias Festival in Chateauroux. Winner of the coveted First Prize in the 1998 YCA International Auditions at age 14, his recital débuts in New York and Washington were acclaimed. The Washington Post’s headline called Vassilis a “Young Master on the Rise." Since his American debut, aged 15, Vassilis has performed in virtually all of the US. Major appearances include recitals at Carnegie’s Weill Hall, New York's Morgan Library, Isabella Gardner Museum in Boston, Philadelphia's Kimmel Center and the Kennedy Center in Washington. Following his debut recital at Carnegie's Zankel Hall, Mr. Varvaresos was invited to perform at the White House for President Barrack Obama. Mr. Varvaresos represented Greece at the 2008 Beijing Olympics. He has been named “Most Promising Young Greek Artist” by the Critics' Association of Greece and has been a regular soloist in all the major stages of his home country. Vassilis Varvaresos is the laureate of both the 2014 edition George Enescu International Piano Competition, held in Bucarest in September 2014, as well as the Piano Masters Competition held in Monte Carlo in September 2015. An avid chamber musician as well, he has been invited to perform at the Bozar Theater in Brussels, the Spiegelsaal of the Concertgebouw, the Diligentia Theater of the Hague, and the Gasteig in Munich. His regular chamber music partners include the leading French musicians as Michel Dalberto, Henri Demarquette and Nicolas Dautricourt, and Noé Inui. Besides performing, Vassilis Varvaresos has written music for ten films and several television series and wrote the book “Departure From the Functionality of Syntax”, which was awarded the Scholastic Distinction Award at the Juilliard School. Mr. Varvaresos holds a bachelor, masters Musical Arts degree from the Juilliard School. He is a recent graduate of the prestigious Diplôme d’ Artiste-Interpète degree at the Conservatoire Nationale et Superieur de Musique et de Danse in Paris, France, under the tutelage of Michel Dalberto. Vassilis Varvaresos has recorded with NAVIS Classics with violinist Noé Inui and barytone Dimitris Tiliakos, while he will be releasing his new solo album with APARTE Records in the spring of 2018.